For Deborah Faul, it’s about connection. 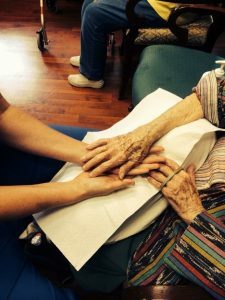 Her senior-focused massage therapy service, she says, provides clients with respite from the pains of aging and some much-needed human touch. Faul operates True Balance & Tranquility, LLC, from the wellness center at The Verandah, Graywood’s assisted living facility. She meets with private clients, too, who range from bedridden to physically active.